(Book). 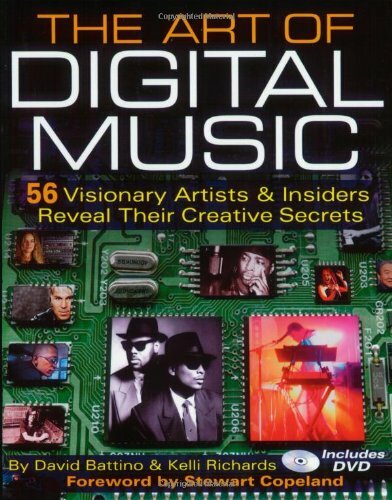 This inspiring volume gathers the wisdom and groundbreaking techniques of 56 visionary artists, producers, programmers, provocateurs, instrument designers, label executives and industry leaders. Hear firsthand how the masters wield technology to create their amazing music the enclosed DVD features highlights from each interview. You'll learn studio setup tips, secrets of sampling, creative quantization, ringtone tricks, production strategies, insights from video-game composers, insane distortion recipes, how to squeeze expression from loops, how to overcome software option anxiety, how to exploit happy accidents, and much more. Derived from a year's worth of in-depth interviews, this book is a richly detailed journey into the heart of computer-aided creativity. Contributors include Glen Ballard, BT, LTJ Bukem, The Crystal Method, Chuck D, Thomas Dolby, Herbie Hancock, Jimmy Jam, Alan Parsons, Phil Ramone, Todd Rundgren, Don Was, and many more. The bonus DVD also includes: over 25 complete songs * live-performance videos * interactive Flash movies * royalty-free samples and loops by the artists * behind-the-scenes photos * and more. If you have any questions about this product by Brand: Backbeat Books, contact us by completing and submitting the form below. If you are looking for a specif part number, please include it with your message.